We are pleased to introduce AquaFit™! AquaFit™ is the only automatic and fully autoclavable sterile irrigation system on the market. 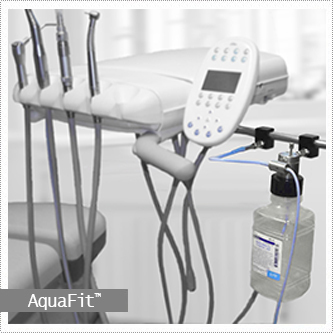 AquaFit™ seamlessly integrates with most dental units, providing superior patient care. The AquaFit™ system is a valuable addition to any dental office, decreasing procedure times while increasing patient volume and value. AquaFit™ seamlessly integrates with most dental units as a convenient and discreet retrofit. It works simultaneously with an existing foot pedal and toggle switch, providing sterile irrigation on demand. AquaFit™ works with any cannula system or external handpiece irrigation port, making it ideal for periodontal surgery and implants, endodontics, oral surgery, and general dentistry. Superior patient care has never been so convenient. The AquaFit™ system is a valuable addition to any dental office, decreasing procedure times while increasing patient volume. Set-up and tear down times are fast, boosting productivity and increasing the bottom line. AquaFit™ eliminates disease transmission and patient cross-contamination. No other system provides as much value. The unique and proprietary design of the AquaFit™ system allows for easy irrigation control, instant on/off and no footprint. The AquaFit™ system eliminates the need for peristaltic pumps, additional staff for hand lavage, as well as waste and water treatment systems. Nothing performs better. For more information, please call 888-539-3907.